Mother’s Day has always been about the food and the most amazing meals. As the years have gone by my dishes have gotten more and more elevated. Now Mother’s Day is one of the most anticipated days on my food calendar! Perhaps Mother’s Day is so great for food because there isn’t the pressure of traditional holiday menus. So on Mother’s Day you can experiment with dishes. Maybe you’ll even start some new traditions. My Mother’s Day menu changes every year but one thing remains the same. Amazing dishes full of flavour! This year I went with a varied menu of beef, vegetables, salad and seafood. I found some succulent crab legs that I couldn’t pass up. They were the perfect addition to the menu. And of course, no Mother’s Day meal would be complete without a incredible dessert. I started with marinating thin strips of beef in a combination of soya sauce, maple syrup, crushed garlic, brown sugar and a pinch of cayenne pepper. I let those sit for an hour. 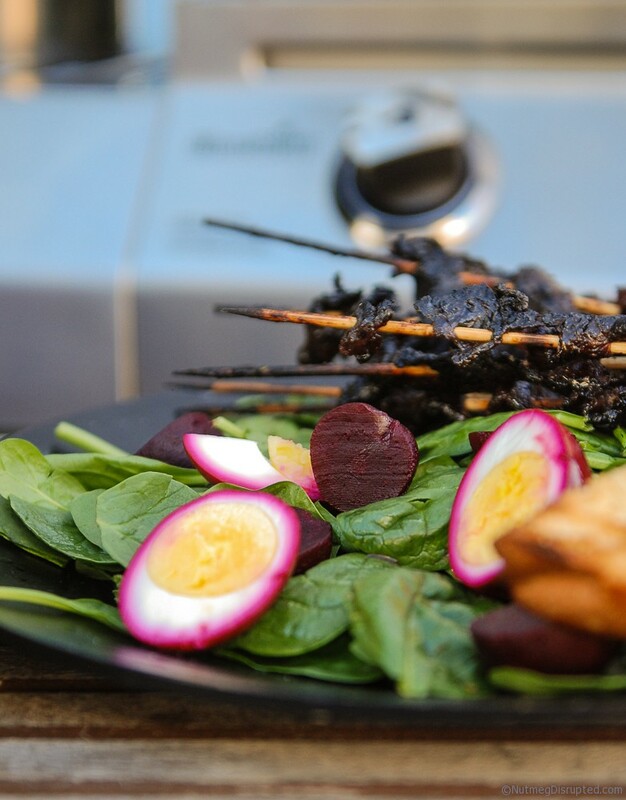 To weave them on the skewers I just folded the meat back and fourth into neat little stacks. I stuck the skewers through the center of each stack and pulled the beef from the top up the length of the skewer. If you can get the rouladen cuts of beef these work perfectly and saves the work of thinly slicing the beef. If you can not find the rouladen cut chose a nice steak. Pop the steak into the freezer for 30 minutes before cutting. This makes for an easier job of achieving nice thin strips. 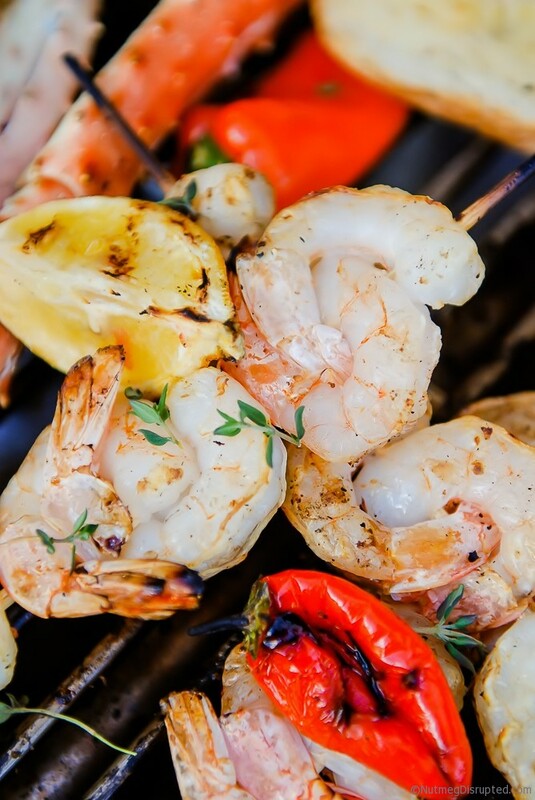 After you are done with the beef put the shrimp on to skewers. Run the skewer through the tail section then the head section for a nice snug fit. In a small sauce pan place a few cloves of crushed garlic, a squeeze of lemon and 1/2 to 3/4 cup butter. Heat this on the side burner while you are grilling. 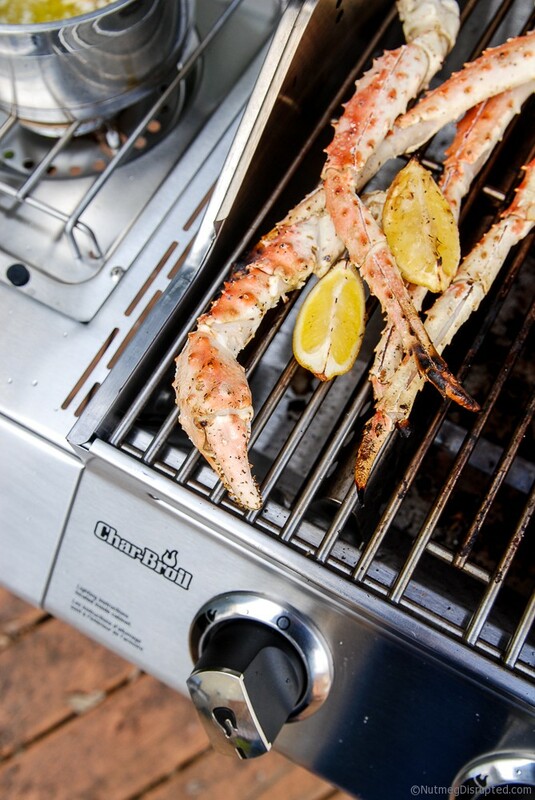 You can use this to not only baste the shrimp as they are grilling but to dunk the finished crab into. Set your BBQ to medium heat. Start with the crab legs. I cooked them from frozen. Just set them on the grill and give them a flip every once in a while. After about 10 minutes you can add the beef and shrimp skewers. I added a few baby sweet peppers and lemon wedges that were drizzled with a touch of oil to the grill. Grill everything for another 10 minutes, basting the shrimp with the lemon butter. Place the butter on a hot mat on the table. Remove everything to a large platter to be served family style with fresh salads and crusty bread. We have the perfect dish to finish off any Mother’s Day feast. 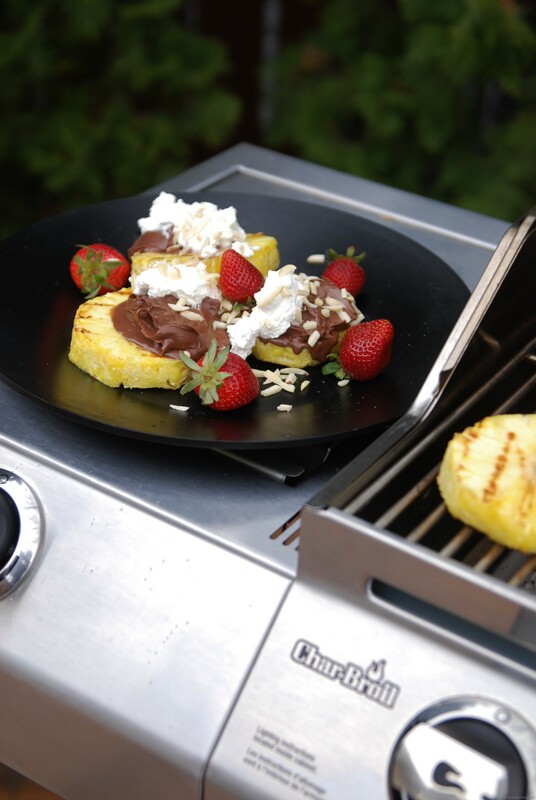 Grilled pineapple topped with Nutella, freshly whipped cream and strawberries. Topped off with a few nuts to add a bit of crunch to this light dessert. To prep the pineapple cut the top and bottom off. Stand the pineapple up and from top to bottom cut off the skin. Now you can cut it into nice thick slices. Place on the grill cooking until it has nice sear marks and has become tender. Remove to a platter. While still warm add generous dollops of Nutella to the slices. Top with whipped cream, slivered almonds and fresh strawberries.